Borax (also known as sodium borate, sodium tetraborate or disodium tetraborate) is a natural white mineral powder, commonly found in many household products, and is used for many purposes, such as detergent, insect killer, herbicide and fungicides, which makes it a great product to help remove black mould. Products like bleach and other commercial cleaning products may be more concentrated than borax and therefore work more effectively on more serious infestations. This is ideal for a lightweight infestation that’s relevantly easy and friendly to use. 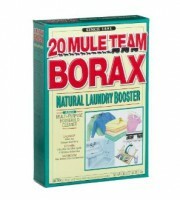 Cup of Borax- can be found in most grocery stores in the laundry isle. While borax is natural, it can be toxic if ingested or excessively made direct contact with it. It is advised to wear safety gloves while using borax, as it can cause mild skin irritations. Once your mould colony is treated, it is important to understand that it grew for a reason in the first place. Mould grows due to environment conditions, and in order to prevent the infestation from developing again, some changes may need to be made to your home and/or habits.